Yes, I continue to have birds on the brain. Yesterday, I was admiring the cormorant chicks at the Point Cabrillo Lighthouse after helping with the Point Cabrillo Breeding Birds Survey then I went to write my woman on water blog which ended up being a banter about birds. Yesterday afternoon, I was bringing gear off of the line in our back yard, and Osprey flew over me at low altitude (about 25 feet) with a nice size salmon in her talons. I was hoping for a dropsy but no such luck. I hope that she enjoyed her salmon dinner. Prior to meeting my guests for a Sunset Bird Paddle, I warmed up on the Noyo with my greenland paddle and found myself birding again. I was stoked to have a few moments with my camera and am excited to share my shots with you. 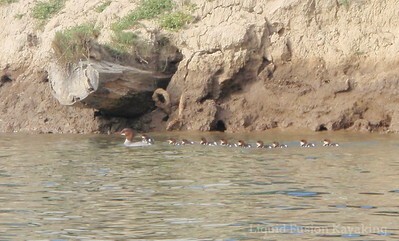 Yes, I photographed the male harlequin again and got a couple of great shots of a handsome great blue heron in breeding plummage.My favorite photo though is of the merganser and her ducklings - in this photo one was riding on mom's back. The swallows have been very active feeding and chittering away along the river. 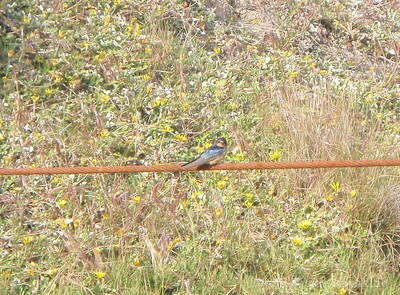 I had several great viewings of 3 barn swallows - close enough to see the irridescence shimmer in their blue feathers. There are a bunch of violet green swallows swooping about but elluding my camera. 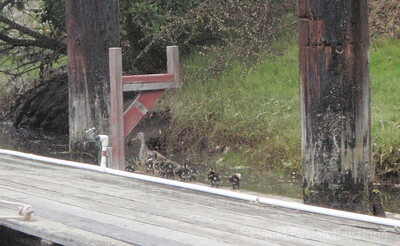 And of course the mamma mallards had to parade their little ones around the marina just before we launched on our sunset bird paddle. 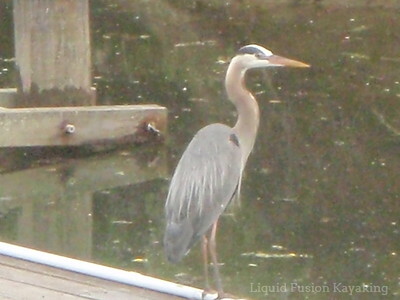 They brought them past us in the water and then for a walk on a log floating next to the dock. Who knows what we will see next.